This page is a stub. You can help us improve the Materia Medica Wiki by expanding it. 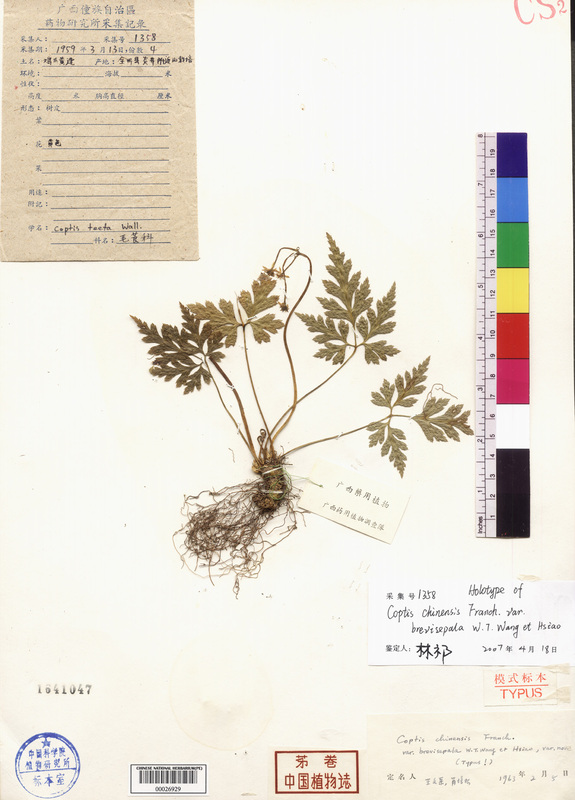 The Chinese materia medica also uses the rhizomes of Coptis deltoidea C. Y. Cheng & Hsiao ( 三角葉黄连 ) and Coptis teeta Wall. ( 雲连 ) as it's standard species. Damp-Heat in the bowels, or heat toxins: dysenteric disorders. 1. Hassler M. (2017). World Plants: Synonymic Checklists of the Vascular Plants of the World (version May 2017). In: Roskov Y., Abucay L., Orrell T., Nicolson D., Bailly N., Kirk P.M., Bourgoin T., DeWalt R.E., Decock W., De Wever A., Nieukerken E. van, Zarucchi J., Penev L., eds. (2017). Species 2000 & ITIS Catalogue of Life, 30th June 2017. Digital resource at www.catalogueoflife.org/col. Species000: Naturalis, Leiden, the Netherlands. ISSN 2405-8858.